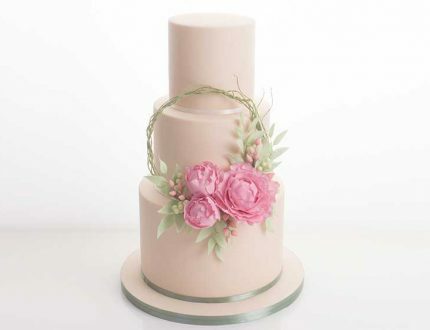 In this lesson, Natalie explains the design and shows her already stacked three tier cake. 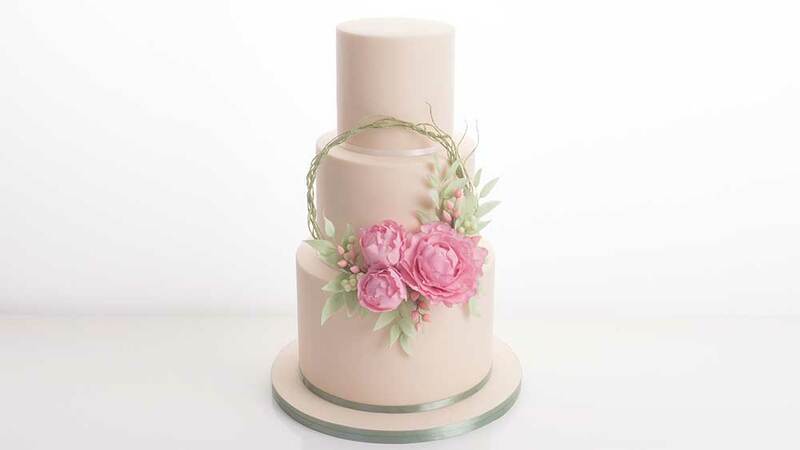 NOTE: If you need guidance on stacking or covering double barrelled cakes, check out Paul’s COVERING A DOUBLE BARRELLED CAKE and STACKING CAKES courses. 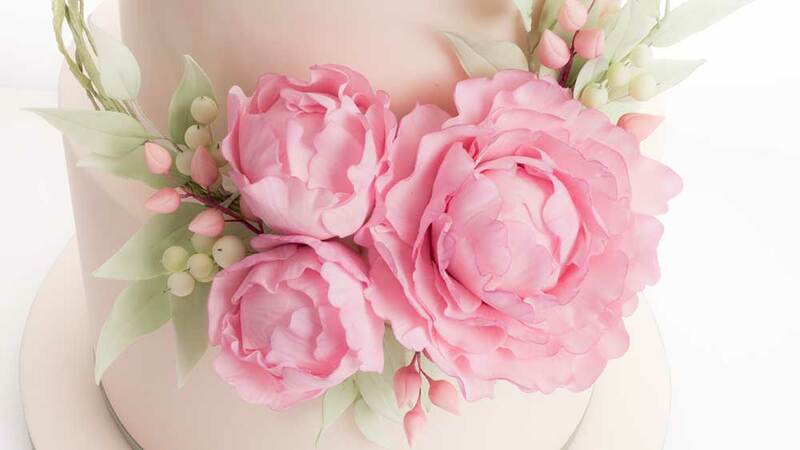 Peonies are beautiful flowers so worth watching how Natalie first shapes the petals then neatly adds them to the buds. 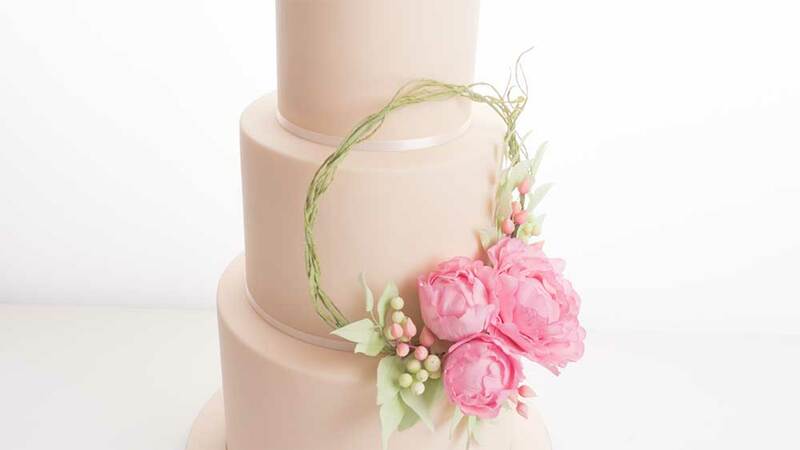 In this lesson Natalie shows you how to easily and effectively create these lovely buds and berries. She then leaves them to dry before getting ready to add the colour. Getting the right shade is very important to the end result when it comes to leaves. Natalie talks through her colour mixes and then goes on to create a number of different shaped leaves, giving each one its own character. It’s fun time!! This is the part that Natalie enjoys most when she can bring all the leaves, buds and petals to life by adding some tasteful colours. 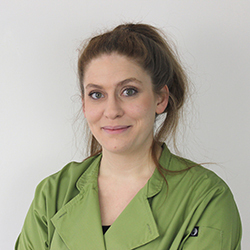 Learn how Natalie chooses the right shade for each leaf, bud and petal then neatly applies to give an amazing finish. Now that all the buds, petals and leaves are all dusted and ready to go, all we need now is to tape them together. 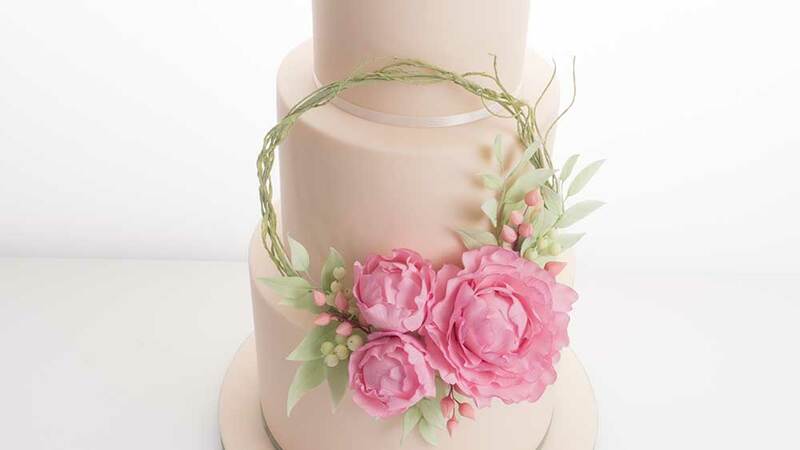 In this lesson Natalie shows how to bring them all together and creates the floral hoop in preparation for bringing it all together on the cake. This is where the magic happens. 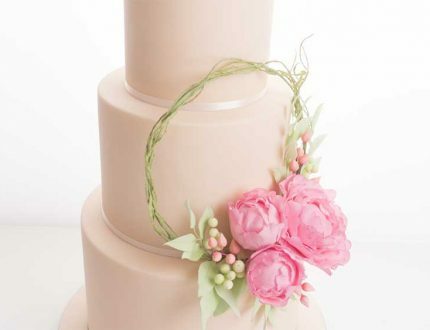 Bringing everything together is where cake artist meets flower arranger, so let your artistic side run wild. Alternatively, follow Natalie as she brings together an amazing arrangement and giving commentary which should help you decide what to place where. 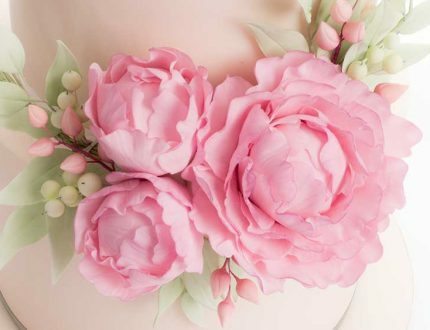 Natalie shares with you some ideas you can use for the peony flower hoop. 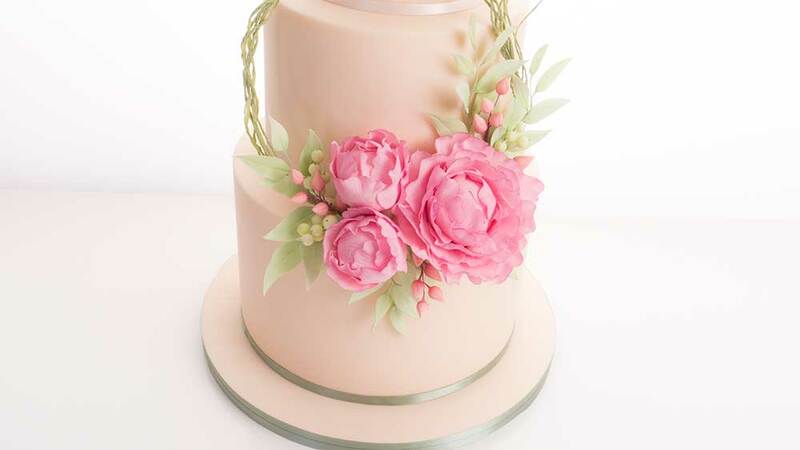 Learn how to make this incredible peony flower hoop sugarflower with Natalie Porter. 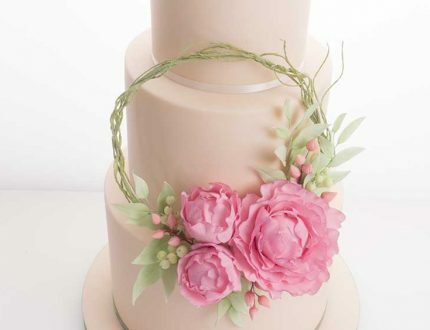 A perfect addition for a whole host of cakes. 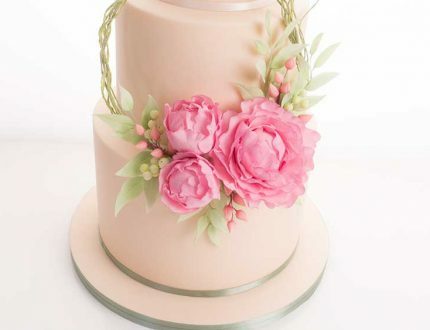 This is one tutorial sugar flower fans don't want to miss!